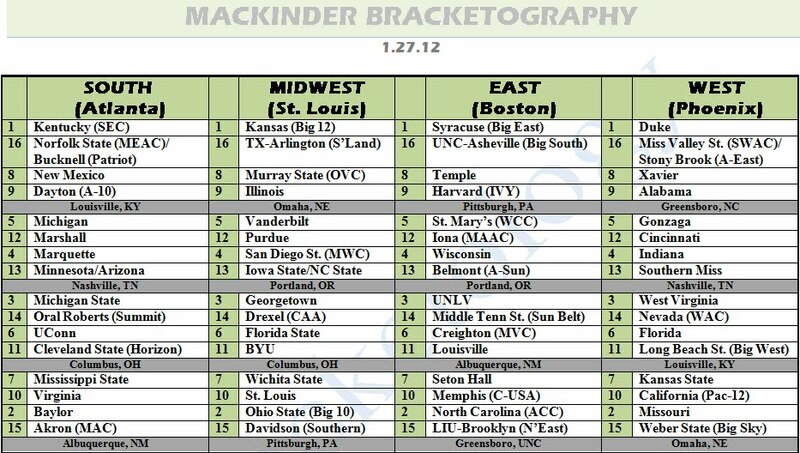 In the first installment of Bracketography 2012, four marquee programs join forces on the top line. Kentucky is undoubtedly the top seed while a small valley separates the Wildcats from the rest of the field. Kansas, on the strength of its wins and overall schedule, gets the nod over Syracuse for the second top seed while Duke's resume allowed it to secure the final spot on the top line. *As per most bracket projections, this would be my projected field if the season ended today. Boy am I happy that isn't the case. The final 8-10 teams have garbage resumes at this point but the committee needs to find 68 teams, right? An interesting trend that you'll notice in my projections and others such as Jerry Palm and Joe Lunardi: More and more mid-majors are being rewarded with higher seeds (see Murray State as a No. 8, Harvard as a No. 9 and Long Beach State as a No. 11). What does that mean? For starters, it means more and more major conference teams - the ones who finish near .500 in their respective conferences but have registered at least a few good wins - are grabbing those 12 and, believe it or not, 13 seeds. Look at the teams in the "First Four" games: Minnesota vs. Arizona and Iowa State vs. North Carolina State. Those teams are 13 seeds because, regardless of conference affiliation, their resumes are worse than likely conference winners from much smaller leagues. Don't expect the bracket to change much in that respect. The "First Four" games featuring the final four at-large selections will be either 12 or 13 seeds. 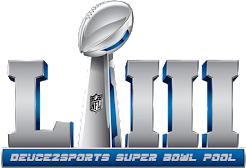 Any projection that pits a "play-in" matchup on the No. 11 line is out of touch with reality. 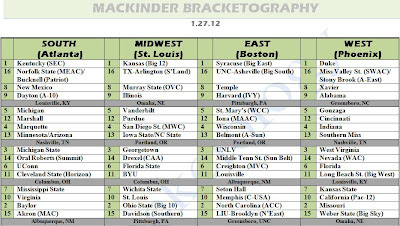 Speaking of reality, one of the greatest things about bracketology is we spend hours debating the last four teams in and out in these fictitious brackets with the understanding that, when March 11 rolls around, the bottom 6-8 teams listed here won't make the field because of auto-bid stealers. So, if you're a fan of at-large teams on those 11-12-13 lines, you should be praying your squad plays itself into the field because other teams will do just that. LAST 10 TEAMS OUT: Texas, Notre Dame, Northwestern, Stanford, Oregon, New Mexico State, Northern Iowa, Colorado State, Mississippi, Central Florida.